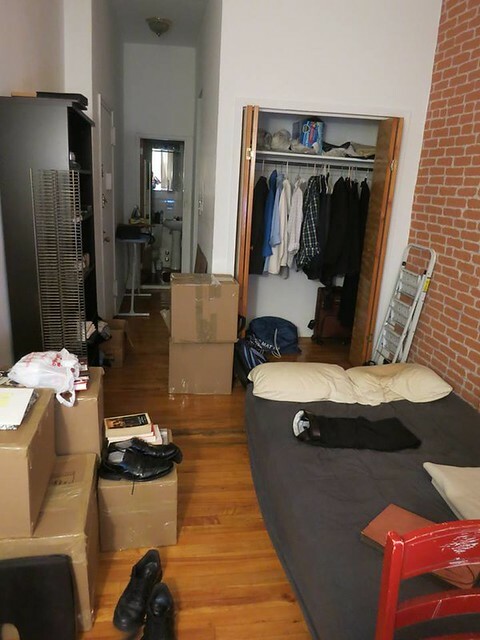 As some of you may know, I used to live in a shoebox-sized studio in New York City. It’s what I imagine hobbits might find comfortable if they existed in real-world Earth. 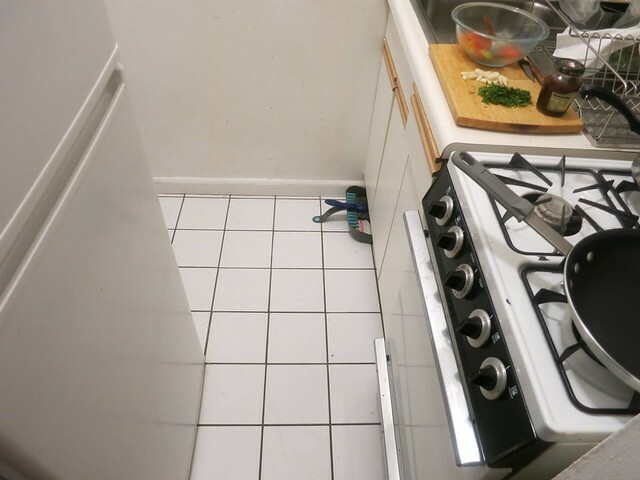 Even the kitchen was hobbit-sized. It’s a miracle I managed to put together all the meals in that little space that are photographed on this here web blog thingy. As you can see, it’s probably barely bigger than your bathroom. Since my move to San Francisco, I’ve been reveling in my new-found freedom. One of the main differences, apart from the fact that I’m cooking for more than one person these days, is that I’ve gravitated to a more meat-oriented diet. This is partly because B’s kitchen is easily five to six times as big as my old space, thus enabling me to attempt more ambitious meals than before, and partly because I’m catering to his preferences. While he loves vegetables, he’s not nearly the flexitarian that I used to be. 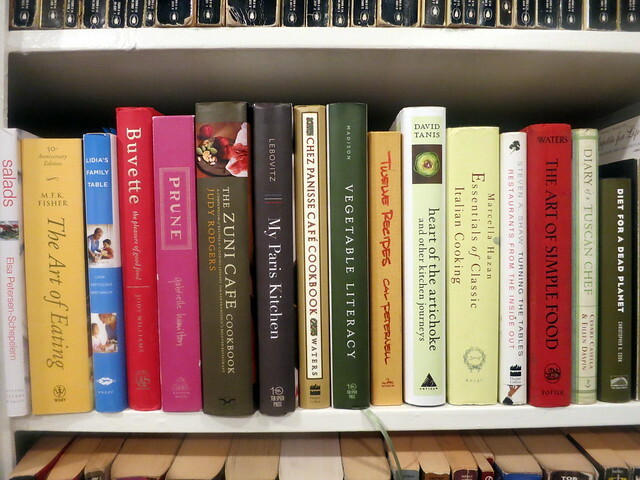 I think it’s funny just how many cookbooks I own are by chefs who’ve worked at Chez Panisse at one point or another during their careers. Before I buy a cookbook, I need to be seduced. It’s not so much ‘Will the recipes work?’ (although that’s important too), but ‘Am I interested in seeing more from you? Does your writing come through loud and clear? Do I want to turn the page?’. The volume that I turn to the most often when I’m not cooking Italian food is The Zuni Café Cookbook. Zuni Café (1658 Market Street (Haight Street)) is a restaurant in San Francisco that became associated with Chef Judy Rodgers, formerly of Chez Panisse, up until her death in 2013. Although Judy is no longer in the waking world, her influence continues to be felt amongst us via her food. Her cookbook reads like a novel, and if you believe as I do that meals and recipes are miniature stories, you’ll find that her masterpiece is a valued companion. 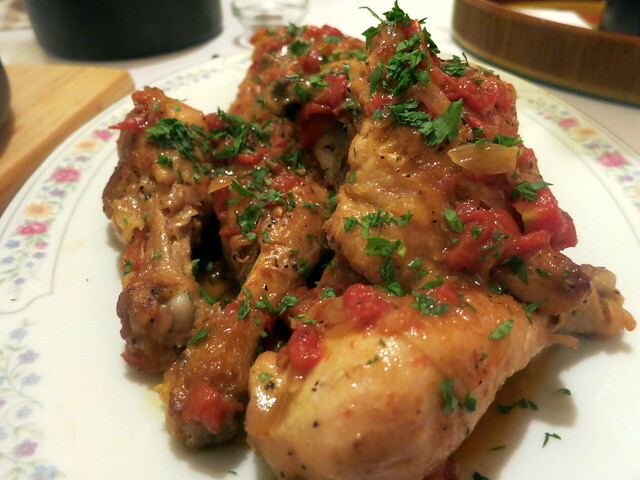 Adapted from The Zuni Café Cookbook by Judy Rodgers. I almost never season a chicken in advance when I make roast chicken, so this recipe is an interesting departure for me. Seasoning in advance operates on the same principle as brining a bird — whether it’s chicken or turkey is immaterial. Using salt in this manner improves flavor, keeps the bird moist and makes it tender. 1 small chicken, about 2 3/4 to 3 1/2 lbs. Wash the bird with cold water, inside and out, then pat dry with a paper towel. Make sure the bird is completely dry before you season it. 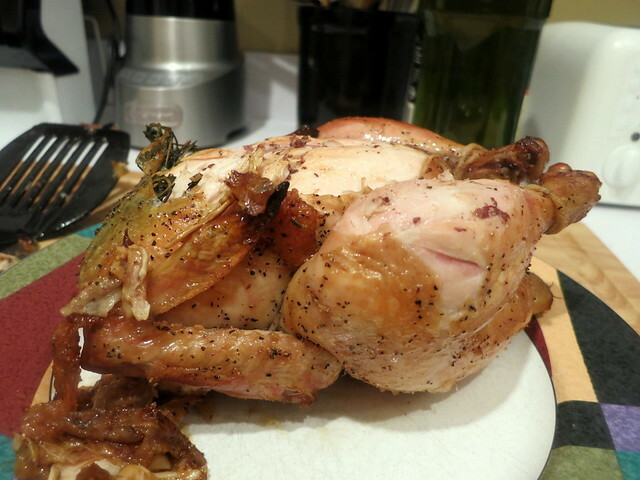 A wet bird will spend too much time steaming in your oven before it begins to turn golden brown. At the rear cavity, carefully make a “pocket” with your fingers alongside the thigh joint on each side. Then do the same at the other end so that there’s a “pocket” under the skin atop each breast. Be careful not to pierce the skin. In the picture above, you can see that hole on the right side of the cavity. That’s what you’re aiming for. Slip a bundle of herbs, like maybe a thyme or rosemary sprig in each pocket. 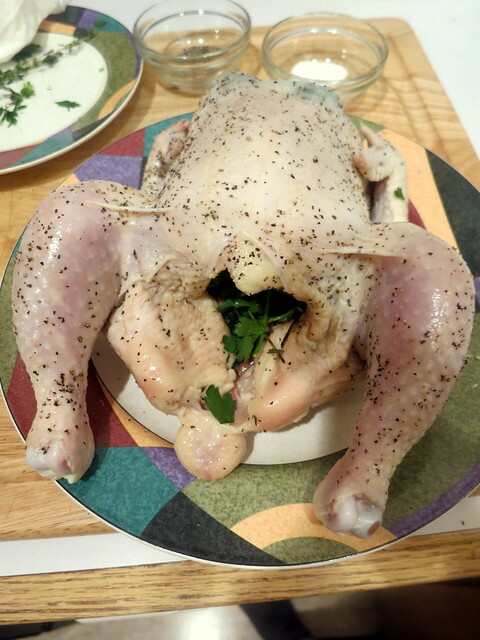 The green at the other end marks where the herbs were stuffed next to the breasts. Stuff the cavity with the remaining herbs if you want. 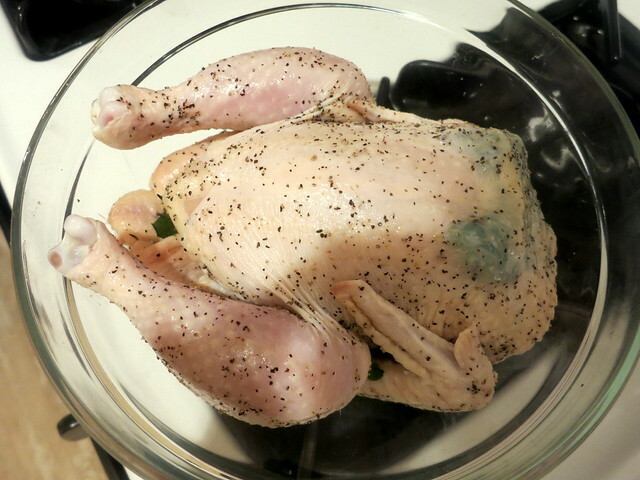 Season the bird all over with salt and black pepper. 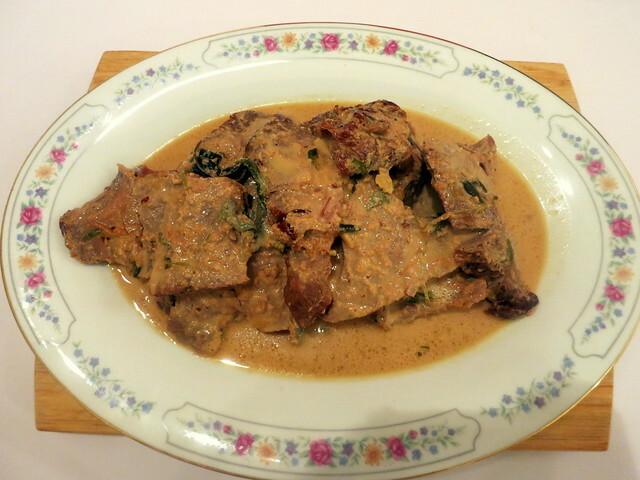 Place the chicken on a plate or in a large bowl, then cover with an inverted plate. Refrigerate overnight, or preferably 1-2 days before you plan on cooking the chicken. If you have room in your refrigerator, as an alternate method, place the chicken atop a small rack and set a large plate underneath it to catch any drips. Set a large bowl over the chicken. Make sure that the bowl doesn’t touch the chicken. 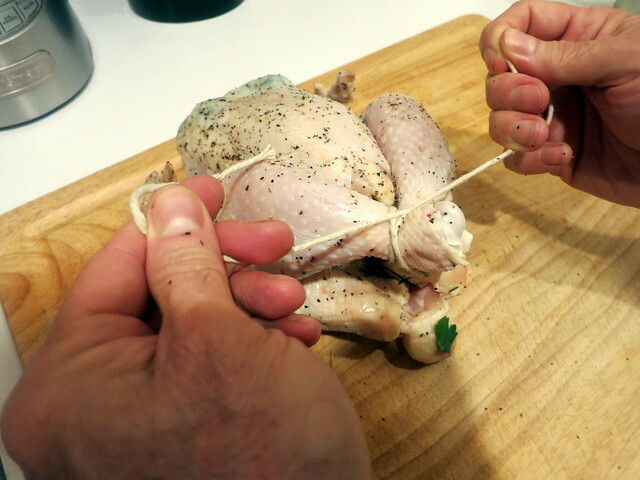 Judy’s recipe doesn’t involve trussing, but I’ve included a simple knot here. 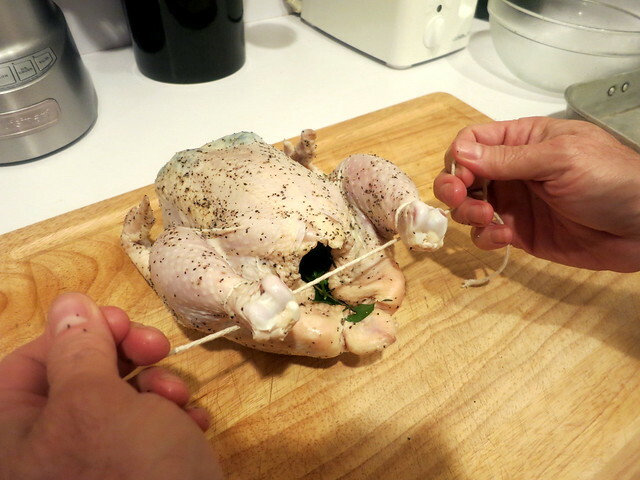 Trussing is a technique that helps the chicken cook evenly and also makes for a better presentation. You’ll want a good length of kitchen twine. The section shown here was about 18″ long, and we needed nearly twice that amount. That’s why you’ll see a few picture frames later that the string somehow mysteriously grew longer, 😉 because we started over again once we realized that it was too short. Loop each end around the legs and draw them close together. Tie the legs together so they’re nearly touching. 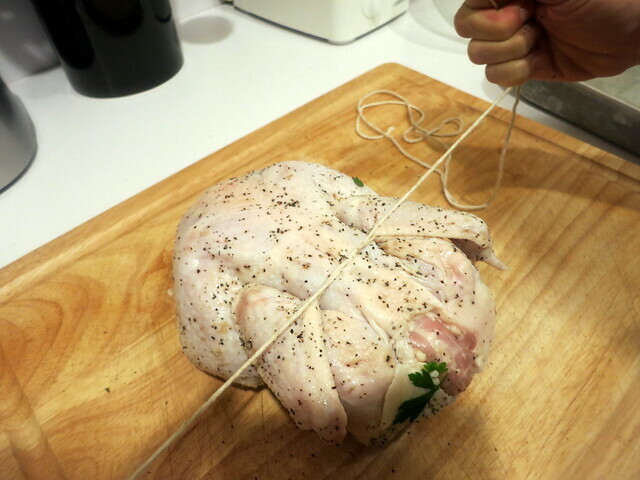 Next, loop the string around and over each leg, then flip the bird over…. …and form a knot in the backside. Tie off the knot and snip the ends off the twine. You should end up with something like this, ideally. Once the oven is ready, roast the chicken for 30 minutes, breast side up, then 10-20 minutes on the other side, then 5 minutes breast side up. Meanwhile, prep the ingredients for the bread salad. Combine the currants with the red wine vinegar and the boiling water. Set aside. The boiling water will help the currants plump, while the vinegar adds tartness. Set aside while you prep the rest of the salad. 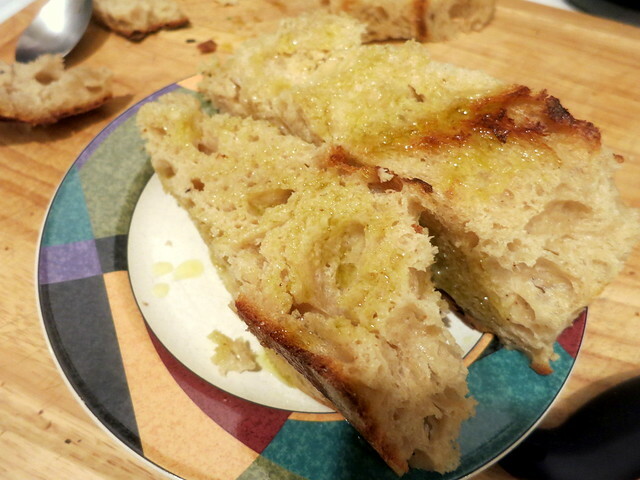 Brush the bread with the olive oil on all sides. Broil the bread so that the top and sides are lightly colored and crisp, then turn over and broil the other side. Remove from your broiler and let cool, then slice into cubes or tear into bite-sized chunks. Combine half the remaining olive oil along with the white wine vinegar. Taste for salt and pepper. Set aside. 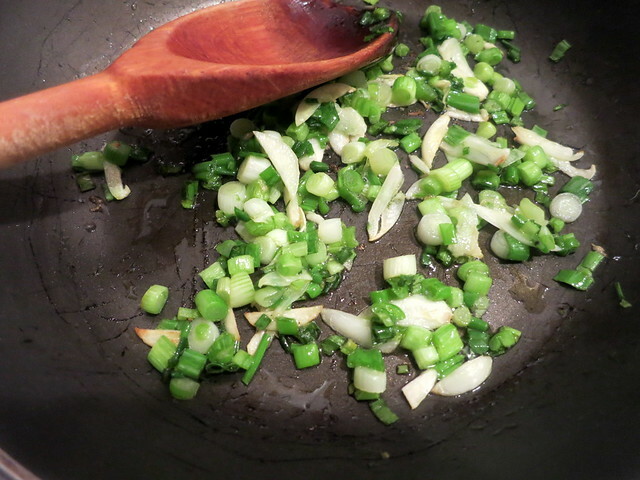 Warm a tablespoon of olive oil in a small pan over medium-low heat, then add the garlic and scallions. Cook, stirring occasionally, or until the garlic smells fragrant and the scallions begin to soften. Don’t let the garlic color. Scrape the contents of the pan into the bowl of bread cubes. Warm the pine nuts in a baking dish in the oven or in a microwave for 30 seconds. 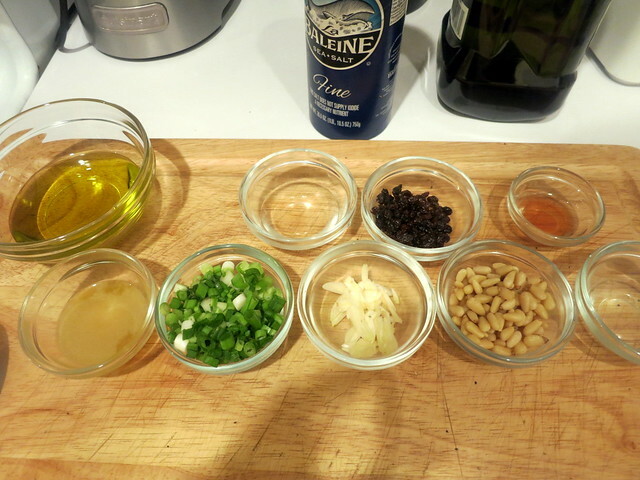 Add the pine nuts to the bread cubes. Add the currants and their soaking liquid to the bread cubes. 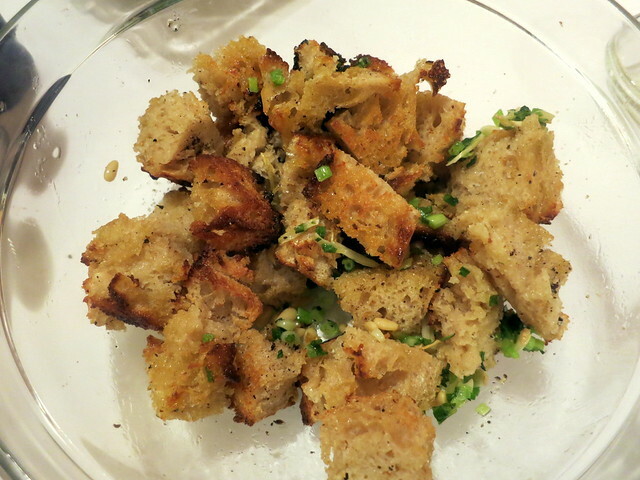 Season to taste with salt and pepper, then toss the bread, scallions, garlic, pine nuts and currants together. 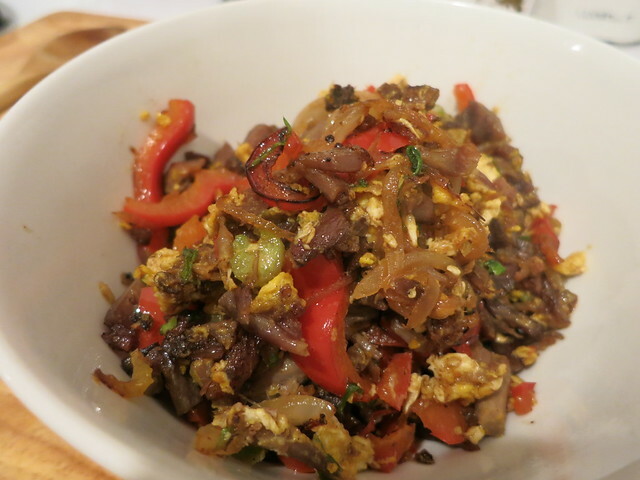 Taste for salt and pepper; if the bread tastes bland, adjust seasoning. Drizzle a few teaspoons of the white wine vinaigrette onto the bread cubes. Toss a few times. 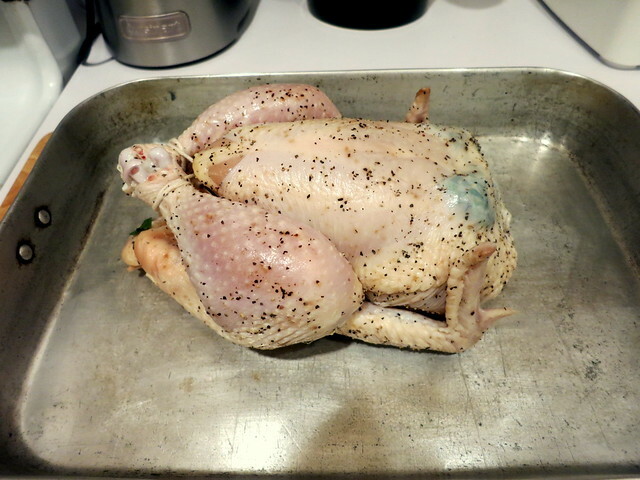 Remove the chicken from the roasting pan once it’s done, and set on a plate. 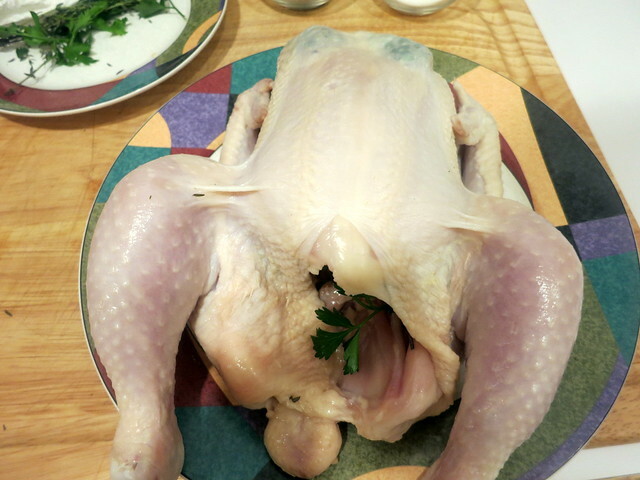 Slash the chicken skin to release the juices, then tip the juices into the roasting pan. Skim off any fat from the drippings. Place the roasting pan over medium-low heat, add any juice that has collected under the chicken, and bring to a simmer. Stir and scrape to soften any drippings that have hardened. 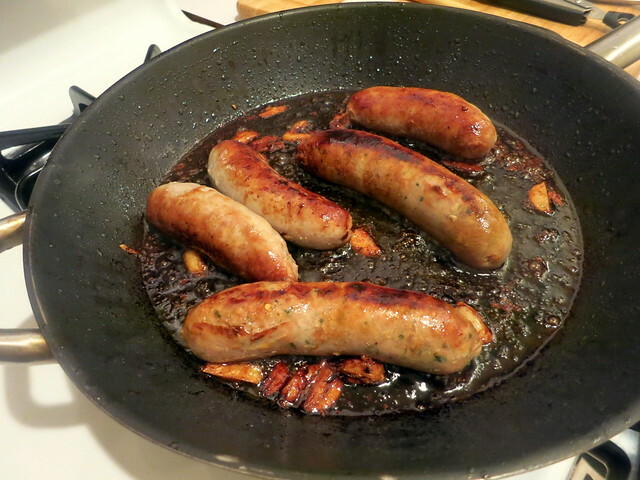 Deglaze with 1/4 cup of water if necessary. Strain the drippings, then set aside. 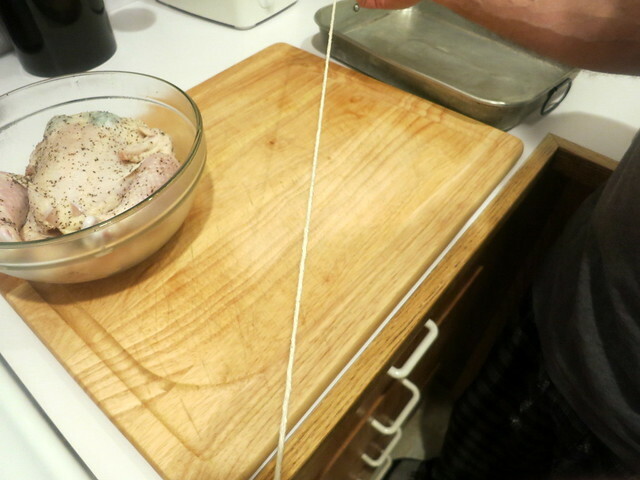 Slice or tear the chicken into bite-size chunks. 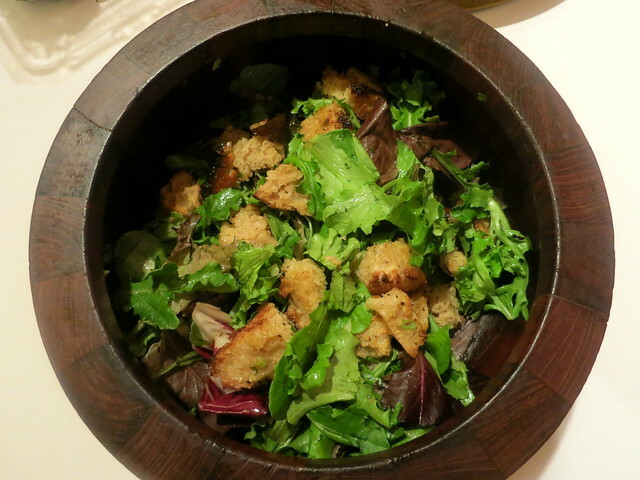 Add several handfuls of salad greens to a salad bowl. Combine with the bread cube mixture. 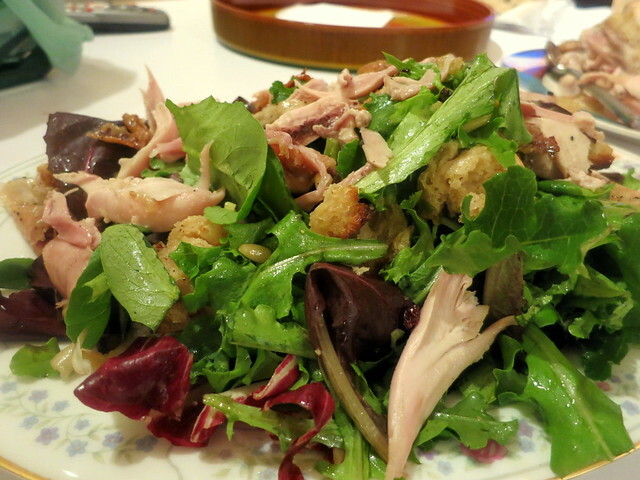 Drizzle some of the chicken pan sauce over the salad, along with any leftover white wine vinaigrette. Toss. Taste once more for salt and pepper. 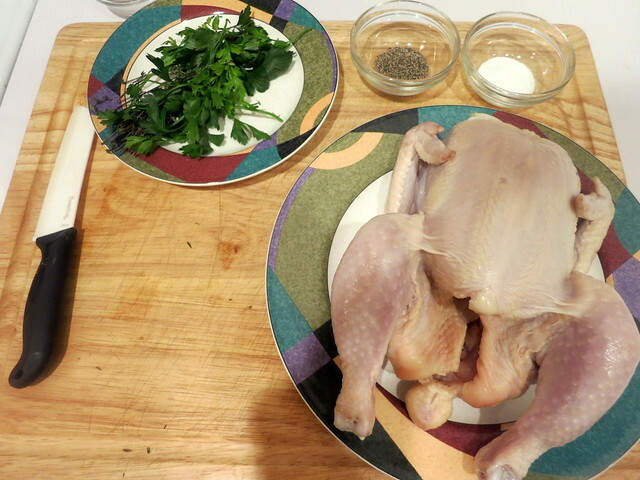 Transfer the salad to a serving platter and top with the chicken. Serve immediately. This recipe is sized for 4-6 people. Time: About one hour, not including prep. 25 Oct	This entry was published on October 25, 2015 at 5:09 am. 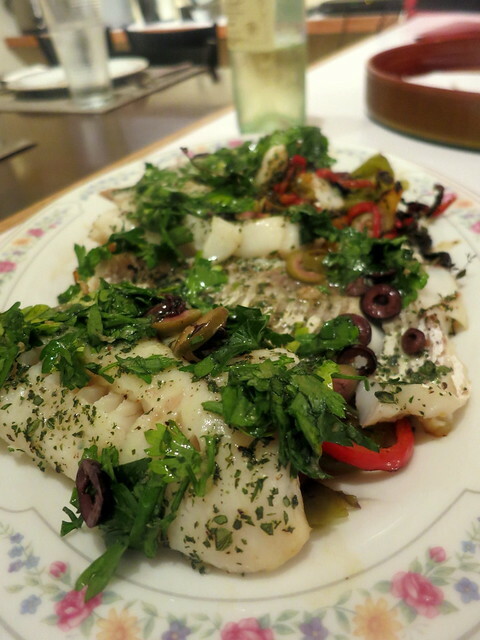 It’s filed under American cuisine, food, food photography, San Francisco and tagged American cuisine, California cuisine, Chez Panisse, food photography, Judy Rodgers, New York City, San Francisco, Zuni Cafe. Bookmark the permalink. Follow any comments here with the RSS feed for this post. Good to see you back, you were missed, thank you. I never left. Thanks for stopping by! I need to let you know how jealous I am that you have both a food blog and a more than rudimentary understanding of how to use a camera. The latter has always frustrated me. The chicken looks great. Most food photography is 90% lighting and 10% aesthetics in my experience. Always looking to improve.